Shitennoji Temple in Osaka was founded by Prince Shotoku (Shotoku Taishi, 574-622) in 593 during Japan’s first wave of temple construction. It is one of Japan’s oldest Buddhist temples and is dedicated to the four directional guardians (Shitenno). The inhabitants of Osaka call the temple lovingly “Tennoji-san,” the way you’d address a person. This photograph shows the Kondo (Golden Hall), based in the center of the temple buildings. Behind the Kondo is a five-story pagoda, and behind that, part of the corridor can be seen. The linear placement of a middle gate (Chumon), five-storied pagoda (Gojunoto), gold painted hall (Kondo) and a lecture hall (Kodo) is called the Shitennoji method. Shitennoji was born out of war. The sixth century saw a bitter struggle between the pro-buddhism Soga clan, affiliated with Shotoku Taishi, and the anti-buddhism Mononobe clan. Shotoku Taishi made a vow that he would build a temple if the Mononobe were vanguished. They were finally defeated by the Soga in 587 and Shotoku Taishi kept his word. Shitennoji’s location was chosen to impress. Naniwa (current Osaka) was Japan’s most important point of entry for trade and diplomatic contact with the rest of Asia. The temple would be the first structure that foreign visitors would see. The view from the temple was spectacular. It was said that Awaji Island, across the bay, could be seen from the top of the pagoda. This great location allowed priests and faithful to observe the sun setting on the bay, a form of meditation. Shotoku Taishi played a major role in introducing Buddhism to Japan during the reign of Empress Suiko (reigned 593-628). He also founded Horyuji in Nara Prefecture, which in 1993 became Japan’s first UNESCO World Heritage site. It holds over 2,300 important cultural and historical structures and articles, and consists of the world’s oldest surviving wooden buildings. Shitennoji, unfortunately, was not that lucky. The temple was often destroyed in wars and reconstructed each time. 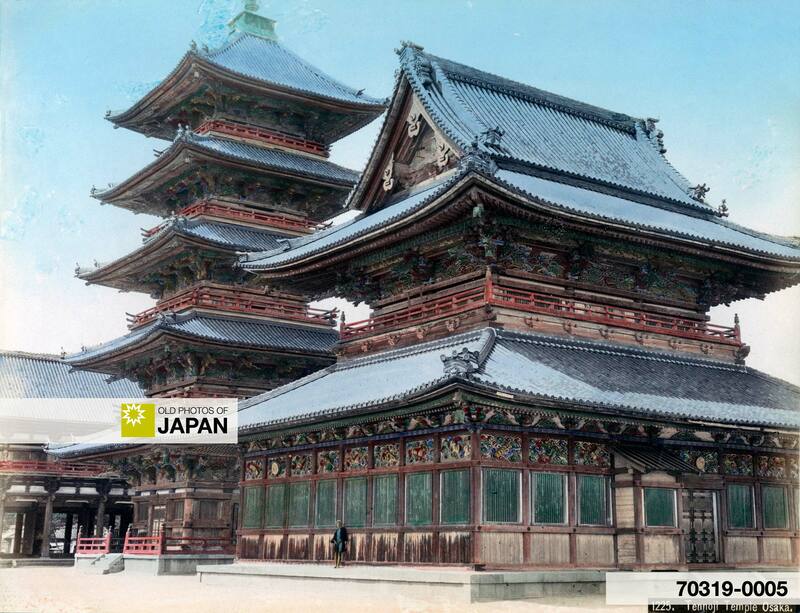 It was badly damaged by the devastating Muroto Typhoon of 1934 (see photo above), after which a large-scale renovation was carried out to bring the temple back to its former glory. However, just a few years after the reconstruction was completed, WWII would bring an end to the wooden buildings. Situated in the industrial power base of Japan, several buildings, including the Kondo and the pagoda, were completely destroyed by US firebombs in March 1945. In the early 1960s, they were rebuilt in concrete. This photograph, showing the Kondo and Pagoda before all the destruction took place, is therefore of great historical importance. Although it is now a concrete structure, Shitennoji is still the home of many colorful matsuri (religious festivals). One of the most exciting is undoubtedly “Doya-Doya”, held on January 14th. Hundreds of young men, clad in nothing but white and red loin cloths, brave the cold weather to fight over lucky amulets. As priests throw cold water on the heated crowd of youths, steam rises from their bodies. On the 21st of every month it also hosts Osaka’s largest temple market, the Daishie. Boasting over 600 stalls, it is especially famous for clothing (including used kimono), antiques, chinaware and food. Dutch pilgrim Ad Blankestijn, who made an extended pilgrimage to Japanese temples, has written a beautiful description of a visit to modern Shitennoji. 1 Shitennoji, Shitennoji. Retrieved on 2007-04-02. You can also licence this image online: 70319-0005 @ MeijiShowa.com.